A police officer’s duty is to serve and protect the community. 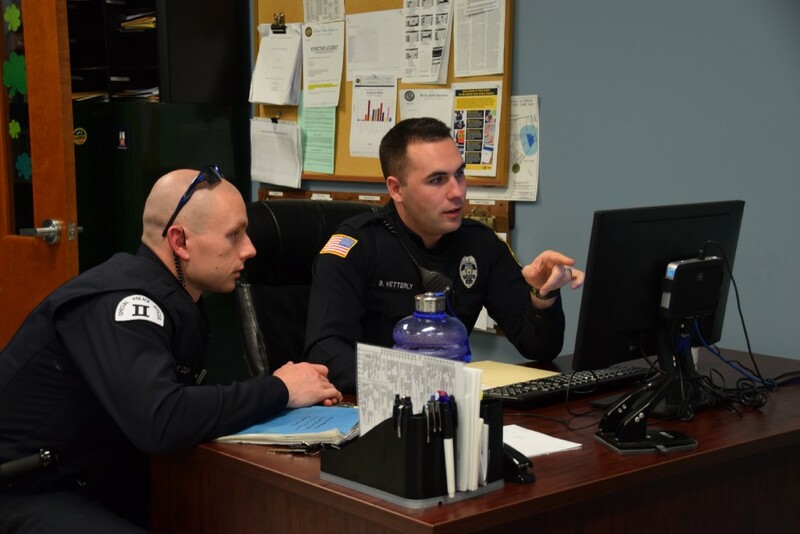 The men and women in blue can be seen patrolling neighborhoods and pulling drivers over for various violations, but what exactly goes into the day-to-day operations of a police officer? The Sun rode with Sgt. TJ Varano from the Berlin Police Department on a recent Friday afternoon to find out. The afternoon got off to a later start than planned, and it was apparent then that this day could go in many directions. A juvenile had just been arrested for stealing dirt bikes throughout surrounding towns and was taken into custody for questioning, and two girls in their early 20s were arrested for drug possession. All three had mugshots taken and fingerprints processed. Tears were flowing from one of the girls while her friend consoled her as police entered their information into computers. At 3:35 p.m., the police vehicle pulled out of the parking lot onto the White Horse Pike and made its way to Route 73 before pulling over to check for speeding vehicles. As Varano pulled his car into a parking lot, he talked about the things he and his fellow officers have to worry about while on the job. He called it “a big juggling act” — worrying about people speeding, but at the same time, thinking about patrolling neighborhoods on the other side of town. Varano said the police report on everything, from calls reporting a lost animal to domestic abuse at a home to getting drugs off the street. At 3:52 p.m., Varano pulls back onto the road. He almost immediately sees a gold car in front of him swerve and calls the radio dispatcher to do a registration check on the car’s license plate number. The dispatcher tells Varano the license plate number belongs to an aqua car, not gold. “He could have switched the tags,” Varano said. He continues to follow the car as it makes a left onto Hayes Mill Road. Varano puts his lights on and pulls the car over at 3:55 p.m. He takes the man’s driver’s license and registration and runs it on the computer while back up arrives. Officer Brett Vetterly performs a series of tests on the male, all of which he passed. No tickets were given, just a warning. As Varano pulls away, he hears a multi-vehicle accident called in and makes his way to the scene on White Horse Pike. He arrives as backup, as Vetterly is already on the scene along with an ambulance. It’s a minor accident with no injuries, so Varano makes his way to nearby neighborhoods to patrol those areas. At 4:43 p.m., Vetterly pulls a vehicle over on Hayes Road. When he gives the dispatcher the vehicle’s license and registration information, it turns out there is a traffic warrant out for this person’s arrest, which was cause for an automatic arrest. The officers use caution since he also had a prior robbery warrant. Varano makes his way over as backup, and Det. Jason Christy also arrives as backup shortly after. Vetterly arrests the male and takes him into custody. Varano’s shift ended, and he made his way back to the police station. The day ended with eight arrests, ranging from theft and drug paraphernalia to outstanding warrants. Every day is different, and Varano said that’s what makes the job exciting and challenging. Varano said it’s all about making sure officers are safe. “Going home safe to our families is our ultimate goal,” Varano said.